When seeking replacement pieces for vintage silver flatware services, it is good to know what was available when the patterns were in production. Many patterns were made over many years. They had so called long production runs, some up to a century and longer. Some were discontinued after a time but reappeared later, similar in style but not always identical. 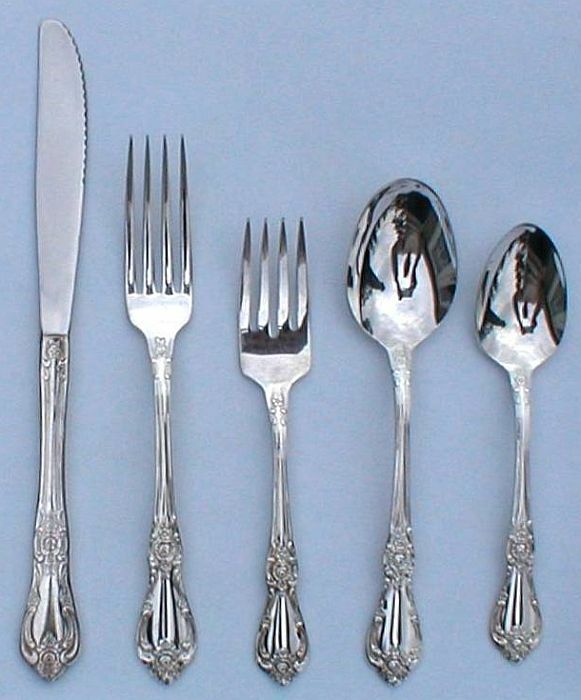 The individual manufacturing plants made flatware patterns to specifications by the sales organizations that had either absorbed or represented them. Among the largest in the U.S. were the International Silver Company, Oneida, National Silver Company, Gorham, Reed & Barton, Rogers = many different ones, Towle, Godinger, Lunt, Wallace. Sources under links courtesy Silvercollection Italy. This does not mean that every manufacturing plant always held to the same standards for the same patterns. One manufacturing plant may have made a slightly longer or shorter knife, fork or spoon than was made in an earlier run by another plant. Shapes of the serving parts--spoon bowls, fork tines, knife blades--can also differ from one manufacturing run to the next within the same handle pattern. To make comparisons today even more difficult, some identical patterns were marketed under different names at different times and in different parts of the U.S. and Europe. One can therefore see double, triple (even quadruple) Also Known As (aka, a/k/a, a.k.a.) names on some patterns. Why did the manufacturers do this? First issued by the International Silver Co. in 1932, the Manhattan pattern celebrated the inauguration of the Chrysler Building in New York City. It was subsequently reissued in 1934 as Beverly Hills with a few small design changes. Why? It was a marketing decision by the sales company. The name Manhattan was well known and respected on the East Coast of the U.S. However, it was thought that the name Beverly Hills would be more appealing on the West Coast where it was well known. In 1951, the Manhattan pattern was again revived to commemorate the 20th anniversary of the Chrysler Building. The 1951 Manhattan pattern was slightly different in styling from the 1932 version (note the cross stripes) but quite similar to the Beverly Hills version. Recently newer production has also adopted the name Manhattan in a very similar pattern. Special flatware promotions in stores, gas stations and on other products. Silverware could be purchased by collecting coupons from products like Betty Crocker, at in-store promotions, or with stamps issued for gasoline purchases at service stations, with Green Stamps in particular. 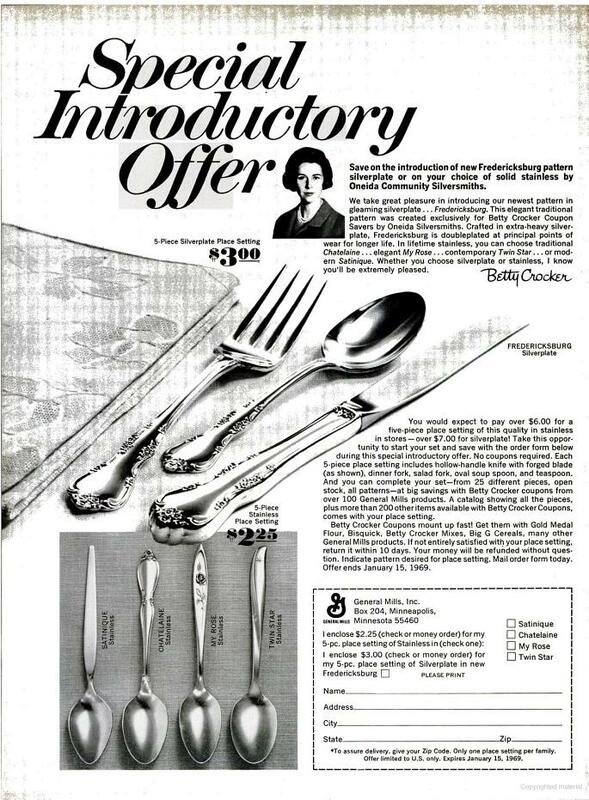 Beauty shops, hardware stores, supermarkets and ladies magazines also participated in promotions featuring silver flatware as seen in this newspaper advertisement, and this Betty Crocker magazine advertisement from 1968 for the Fredericksburg silver plate pattern. 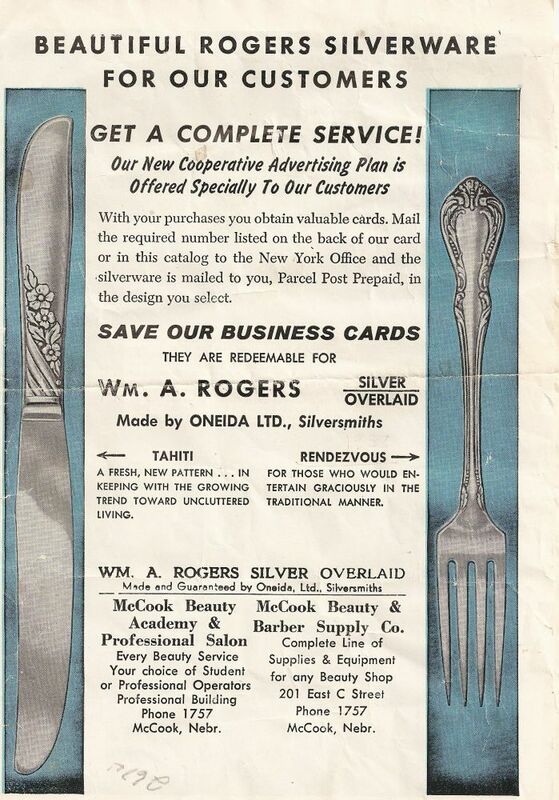 Silverware manufacturers were, however, mindful of not competing with their regular retail sales in department stores and jewelry shops. 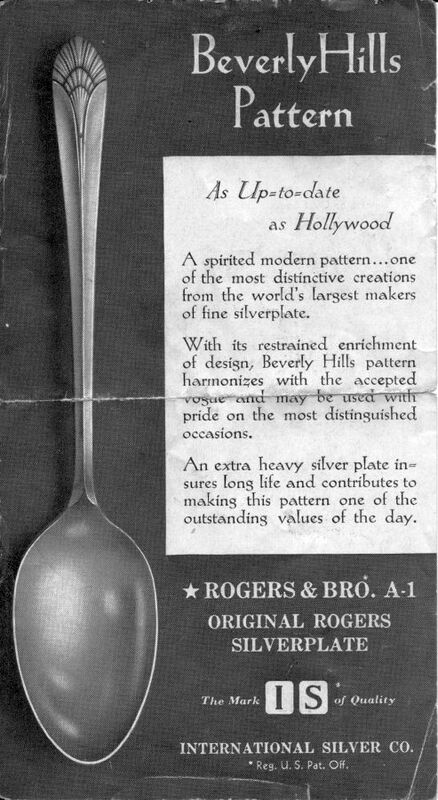 When a silverware pattern was chosen for promotion elsewhere the name was changed. The promotional patterns may also in some cases vary slightly in design or execution from the retail store versions so as not to compete. F.ex., the retail store would offer a hollow handle knife whereas the promotion pattern had a solid handle knife. Although having the same handle design the different issues, retail vs. promotion, could not be confused. But, if you think that's the end of the pattern name mysteries, you need to know that many widely different design patterns can also have the same name. The individual manufacturers did not consult each other before naming a pattern, they just choose one. They couldn't have cared less that the same name had already been used on another pattern, or more than one, sometimes by another manufacturer but also within the same sales organization. F.ex., Rogers, part of the International Silver Co., introduced a pattern named MYSTIC in 1903. Oneida named a totally different design pattern MYSTIC in 1926, but also called theirs Coronet. The name of the manufacturer and Introduction Year of each Name Is The Same pattern are therefore important when shopping for replacements. These determine which design is sought in same-name patterns. You need to look very closely at your pattern before deciding on replacement styles shown on a webpage. You should hold your piece up to the screen near the enlarged view of the pattern shown. Examine every detail to make sure they look the same. You also need to pay attention to the size noted on the webpage. If it states 7 1/2", your piece should be of the same length, see how to measure yours here. 3 pieces = 1 Knife, 1 Fork, 1 Teaspoon. 4 pieces = 1 Knife, 1 Fork, 1 Oval Soup Spoon, 1 Teaspoon. 4 pieces = 1 Knife, 1 Fork, 1 Salad/Dessert Fork, 1 Teaspoon. 5-6 pieces= 1 Knife, 1 Fork, 1 Salad/Dessert Fork, 1 Oval Soup Spoon, 1 or 2 Teaspoons (1 teaspoon for tea/coffe, 1 for dessert). Olive/pickle forks, oyster forks, lobster forks, ice cream spoons ( with small tines at the top), nut picks, butter picks, egg spoons (for boiled eggs), and many others. Most patterns were first offered in Dinner models for use in formal dining but some also later in more casual designs known as Grille or Viande styles. These were introduced during the years of the Great Depression in the U.S. [1930's] when informal lunches and suppers became more popular than formal dinners. To see the difference between the two models, know that a Dinner Knife has a blade of about the same length or slightly longer than the handle whereas a Grille/Viande Knife has a slightly shorter blade than the handle. The Dinner Fork has longer tines and shorter handle than the Grille/Viande Fork which has shorter tines and a longer handle. Some patterns were also offered in Baby and Youth styles and sizes in knives, forks, and spoons. Therefore One Place Setting can start with 3 pieces to include whatever is wanted in it. Exactly what to include in a service is decided by the individual who will use it according to his or her entertaining requirements. 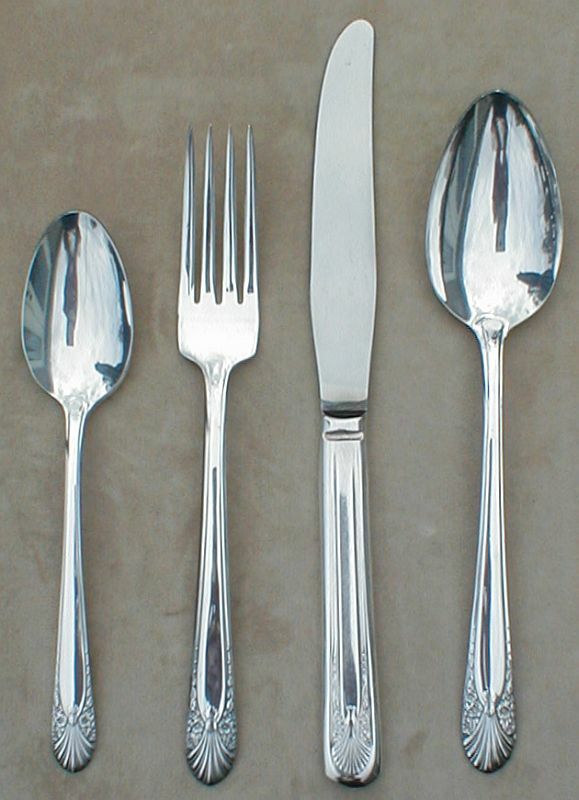 Every flatware pattern did not include optional styles. Most of them were quite basic. 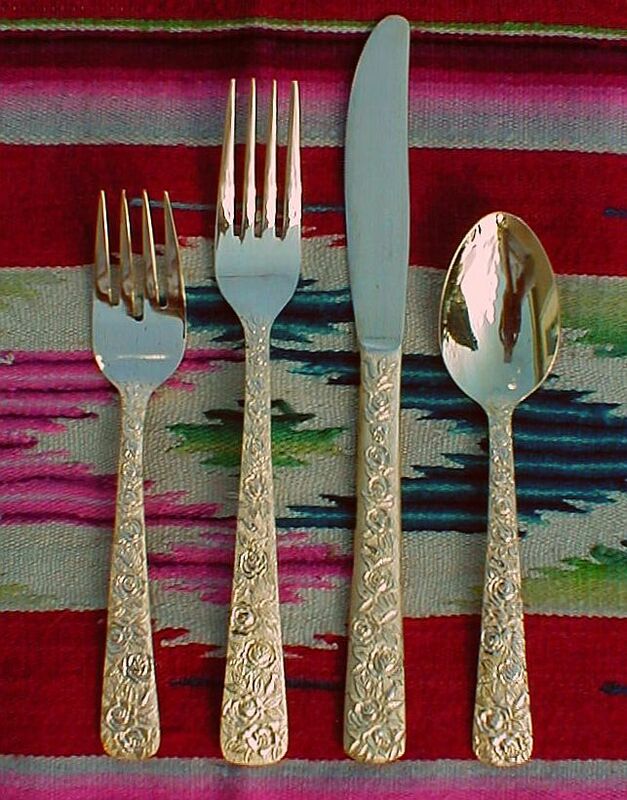 Most standard flatware services (sets) included a few serving pieces, such as one Table/Serving Spoon, one Master Butter Knife and one Sugar Spoon. Additional serving pieces could be purchased separately. What kind and how many depended on how many were offered by the manufacturer in a specific pattern and what the purchaser felt was needed in the service. Carving Knife and Fork Set, with sharpening rod. Salad Serving Spoon and Fork. Services were usually sold with place settings for 4, 6, 8, 10 or 12 people. When starting with a service for 6, f.ex.--usually a wedding present--a young couple often received as gifts or bought themselves additional place settings to expand it. Popular were extra teaspoons as the starting service usually only held the same number teaspoons as the knives and forks. Having extra teaspoons meant that they could be used for dessert in addition to coffee or tea. More serving pieces were also desirable and often given as gifts. Today more and more younger couples discover the joy of owning vintage silverware. A gift of additional matching pieces to their service is always welcome and easy to find and purchase online. Interested in how cutlery is made?